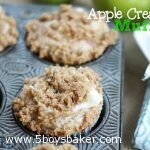 These Apple Cream Cheese Muffins are the perfect muffins for any occasion. Super moist and delicious with a yummy streusel topping. I know it’s still technically fall, but the stinkin’ white stuff that covered the ground here on Saturday and the cold temps tell me otherwise. Winter is definitely here and I’m about as excited for it as I am to get my mammogram in a couple weeks. Buuut, since the calendar still says it’s fall, I figured it would be ok to share these delicious Apple Cream Cheese Muffins with you today. I’ve kind of been on an apple kick lately because I have a fridge full of them thanks to family and friends and I hate to see them go to waste. We’ve made caramel apples twice, eaten them with dinners almost every night the last couple weeks, dipped them in peanut butter, eaten them with cheese and enjoyed a yummy rustic apple pie the other night. I’m surprised my boys haven’t started a protest against apples at our house. I’ll let you know if that happens. These muffins were a great way to sneak apples into our meal the other night without the kiddos even knowing. They loved them! They are so moist and the cream cheese layer with the streusel topping makes these muffins heavenly. These are the perfect muffin for any occasion. 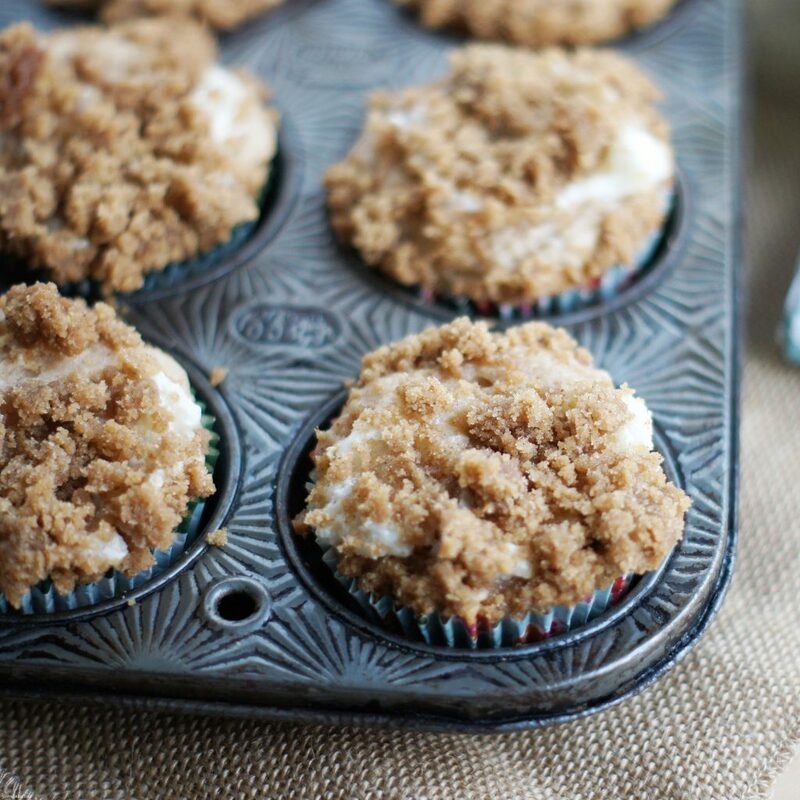 The perfect combination of cinnamon, apples and cream cheese topped with a streusel topping. Scrumptious! Preheat oven to 350°. Line 18-20 muffin cups with paper liners. In a medium bowl, whisk together 3 cups flour, baking powder, 2 teaspoons cinnamon, and salt; set aside. In a medium bowl, beat 4 ounces cream cheese, 1/2 cup granulated sugar, almond extract and vanilla until smooth; set aside. In a small bowl, stir together brown sugar, remaining 1/2 cup flour, and remaining 1 teaspoon cinnamon. Using a pastry blender or your hands, cut in butter until mixture is crumbly; set topping aside. In a large bowl, beat remaining 4 ounces cream cheese and remaining 1 1/2 cups granulated sugar at medium speed with a mixer until fluffy. Add vegetable oil and milk, beating until smooth. Add eggs, beating until combined. Stir in shredded apple and flour mixture until well combined. Divide batter among prepared muffin cups. Divide cream cheese mixture among muffin cups, dropping into center of batter. Sprinkle batter with streusel topping. Bake 30 to 35 minutes or until golden brown.